Will Women Register for Selective Service? Obama's 2nd Term: Who's Time Is 'Our Time'? BERLIN: Germany has "an everlasting responsibility" for the crimes committed by the Nazis, Chancellor Angela Merkel said Saturday, just days ahead of the 80th anniversary of Adolf Hitler's takeover of power. Her remarks came as the world prepares to mark Holocaust Memorial Day on January 27, the date in 1945 when the Soviet army liberated the Auschwitz concentration camp in then occupied Poland. In another significant date, Wednesday will mark eight decades since Hitler was appointed chancellor on January 30, 1933 by then president Paul von Hindenburg. "We must clearly say, generation after generation, and say it again: with courage, civil courage, each individual can help ensure that racism and anti-Semitism have no chance," Merkel added. "We're facing our history, we're not hiding anything, we're not repressing anything. We must confront this to make sure we are a good and trustworthy partner in the future, as we already are today, thankfully," she said. NEW YORK (AP) — The legal challenges over religious freedom and the birth control coverage requirement in President Barack Obama's health care overhaul appear to be moving toward the U.S. Supreme Court. Faith-affiliated charities, hospitals and universities have filed dozens of lawsuits against the mandate, which requires employers to provide insurance that covers contraception for free. However, many for-profit business owners are also suing, claiming a violation of their religious beliefs. The religious lawsuits have largely stalled, as the Department of Health and Human Services tries to develop an accommodation for faith groups. However, no such offer will be made to individual business owners. And their lawsuits are yielding conflicting rulings in appeals courts around the country. "The circuits have split. You're getting different, conflicting interpretations of law, so the line of cases will have to go to the Supreme Court, " said Carl Esbeck, a professor at the University of Missouri Law School who specializes in religious liberty issues. Last year, the Supreme Court ruled that Obama's fiercely contested health care overhaul, known as the Affordable Care Act, was constitutional. But differences over the birth control provision in the law have yet to be resolved. Under the requirement, most employers, including faith-affiliated hospitals and nonprofits, have to provide health insurance that includes artificial contraception, including sterilization, as a free preventive service. The goal, in part, is to help women space pregnancies as a way to promote health. Religious groups who employ and serve people of their own faith — such as churches — are exempt. But other religiously affiliated groups, such as Catholic Charities, must comply. Roman Catholic bishops, evangelicals and some religious leaders who have generally been supportive of Obama's policies have lobbied fiercely for a broader exemption. The Catholic Church prohibits the use of artificial contraception. Evangelicals generally permit the use of birth control, but they object to specific methods such as the morning-after contraceptive pill, which they argue is tantamount to abortion. Obama promised to change the birth control requirement so insurance companies and not faith-affiliated employers would pay for the coverage, but religious leaders said more changes were needed to make the plan work. The Health and Human Services Department said it could not comment on litigation. A spokeswoman also did not respond to a question about when the latest revisions in the birth control rule would be made public. However, government attorneys responding to a lawsuit said an announcement was expected by the end of March. In the suit filed by the evangelical Wheaton College in Illinois and Catholic Belmont Abbey in North Carolina, the court ordered government attorneys to provide a progress report on the new rule every 60 days. Whatever its final form, the mandate will take effect for religious groups in August. At the center of the cases is the Religious Freedom Restoration Act, the 1993 law that bars the government from imposing a substantial burden on the exercise of religion for anything other than a compelling government interest pursued in the least restrictive way. The question of how or whether these criteria apply when owners of for-profit businesses have a religious objection to a government policy hasn't been fully tested. "It's more natural for people to say Notre Dame exercises religion, but when you say this power tool company exercises religion, you have to explain it little more, I think the claims are really the same," said Kyle Duncan, general counsel for the Becket Fund for Religious Liberty, which represents many of the plaintiffs. Brigitte Amiri, senior staff attorney at the American Civil Liberties Union, argued the business owners are trying to use a religious liberty claim to deny benefits to someone else. "We don't think that religious liberty claims can be used as a way to discriminate against women employees — using those claims to take away someone else's benefits and services," Amiri said. In the lawsuits from faith-affiliated groups, such as the University of Notre Dame, judges around the country have generally said it would be premature to decide the legal issues until the federal rule for religiously affiliated organizations is finalized. In the cases involving business owners, judges have granted temporary injunctions to businesses in nine of 14 cases they've heard, while questions about for-profit employers and religious rights are decided, according to a tally by the Becket Fund. In a case brought by Cyril and Jane Korte, Catholic owners of Korte & Luitjohan Contractors in Illinois, a three-judge panel granted a temporary injunction, ruling 2-1 that providing employees insurance coverage that includes birth control would violate the Kortes' faith. "It is a family-run business, and they manage the company in accordance with their religious beliefs," the judges wrote. The dissenting judge argued that the company will not be paying directly for contraception but instead will purchase insurance that covers a wide range of health care that could include birth control, if the woman decides with her physician that she needs it. "What the Kortes wish to do is to preemptively declare that their company need not pay for insurance which covers particular types of medical care to which they object," the dissenting judge wrote. Similar reasoning was used by courts denying an injunction requested by the arts and crafts chain Hobby Lobby and religious book-seller Mardel Inc., which are owned by the same evangelical family. Oklahoma-based Hobby Lobby calls itself a "biblically founded business" and is closed on Sundays. The U.S. district judge who first considered the request said, "Hobby Lobby and Mardel are not religious organizations." WASHINGTON, D.C. — Near-freezing temperatures didn’t stop several thousand gun-control activists from bearing their pickets today, carrying signs emblazoned with “Ban Assault Weapons Now” and the names of gun violence victims in a demonstration organized as a response to the mass shooting in Newtown, Conn. last month. Walking in silence, the demonstrators trudged between Capitol Hill and the Washington Monument over a thin layer of melting snow. 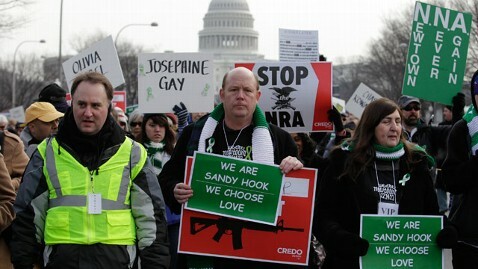 They were joined by politicians and some families of the Newtown victims. “Let’s stand together and use our voices, use our votes to let legislators know that we won’t stand down until they enact common sense gun control laws that will keep our children out of the line of fire,” she told demonstrators. Watts founded One Million Moms for Gun Control after the killing of 20 first graders and six adults at the Sandy Hook Elementary School in Newtown in December. In a profile with the New York Times, Watts said her 12-year-old son had suffered panic attacks after learning of last summer’s Aurora, Colo., theater shooting, leaving her at an impasse over how to talk to him about the latest tragedy. Also among the speakers was a survivor of the 2007 Virginia Tech massacre, Collin Goddard. “We need to challenge any politician who thinks it’s easier to ask an elementary school teacher to stand up to a gunman with an AR-15 than it is to ask them to stand up to a gun lobbyist with a checkbook,” he said. The demonstration comes amid a push by progressive lawmakers to enact stricter gun control measures as a response to the trend of recent mass killings, although any hypothetical bill would likely face strong opposition in Congress. Rep. Chris Van Hollen, D-Md., was among the demonstrators today. The congressman was quoting statistics compiled by the Brady Campaign to Stop Gun Violence. Last week President Obama proposed a sweeping overhaul of federal measures regulating gun ownership, including a universal background check system for sales, banning assault weapons, and curbing the amount of ammunition available in weapon clips. An ABC News/Washington Post poll released Thursday found 53 percent of Americans viewed Obama’s gun control plan favorably, 41 percent unfavorably. The division was visible today, as a handful of gun-rights advocates also turned out on the National Mall to protest what they believe would be infringements on their Second Amendment liberties. ABC’s Joanne Fuchs contributed to this report. The most precise experiment yet to find the proton's radius confirms that it can appear smaller than our theories predict - is new physics needed? NEW YORK: Procter & Gamble reported Friday profit more than doubled in the fiscal second quarter from a year ago, beating market expectations, and raised its forecasts for the year. The US consumer goods giant said profit jumped 140 per cent due to strong productivity gains and the effects of cost-saving efforts. Net income rose to US$4.1 billion, or US$1.39 per share, compared with the year-ago figure of US$1.7 billion, or 57 cents per share, the company said. The results were well above analyst expectations. Core earnings per share, which strips out special items and other items not related to sustainable earnings, were US$1.22, sharply more than the US$1.11 estimated. Revenues came in at US$22.18 billion, above the US$21.91 billion forecast by analysts. Shares in the Dow member were up 3.5 per cent at US$72.87 in late-afternoon trade in New York. "Global market share trends improved as we continued to implement our growth strategy and made very good progress against our productivity and cost-savings goals," said chief executive Bob McDonald. "Our strong first-half results have enabled us to raise our sales, earnings and share repurchase outlook for the fiscal year." Procter & Gamble, which manufactures Pampers diapers, Head and Shoulders shampoo and other household products, said its growth was broad-based and that all five of its business segments grew organic sales by at least two per cent. The biggest growth came in the company's baby care and family care segment with 5 per cent. Procter & Gamble raised its full-year 2013 core earnings guidance to US$3.97-US$4.07 from the previous range of US$3.80-US$4.00. In a conference call with analysts, P&G executives said the company had completed most of a previously announced downsizing to trim costs. In February, the company announced it was cutting 5,700 non-manufacturing posts. McDonald said that 5,500 of the job cuts had already been implemented. At the end of October, the Cincinatti, Ohio-based company had a total of 126,000 employees. The group did not give figures for the end of December. Procter & Gamble also raised its forecast of 2013 share repurchases to a range of US$5-6 billion, up from the previous range of US$4-6 billion. WASHINGTON (AP) — From gun control to gay rights, President Barack Obama's second-term agenda is shaping up as an unabashedly liberal wish list. In less than a week, he's vowed to tackle climate change and protect government entitlements. His administration has lifted a ban on women in combat and expanded opportunities for disabled students. Proposals for stricter gun laws have already been unveiled, and plans for comprehensive immigration reform, including a pathway to citizenship for millions of illegal immigrants, are coming next week. Obama's full embrace of such an agenda suggests a president both freed for action by his re-election win and seeking to capitalize on it. "There is a deep recognition that he has a short period of time to get a lot done," said Jennifer Psaki, Obama's 2012 campaign spokeswoman. "The American people are seeing a man who is determined to finish what he started in his first term, pushing through his agenda without the burden of running for re-election." But following through and winning approval for his proposals will require cooperation from a Congress that is nearly as divided now as it was before the November elections. "If the president pursues that kind of agenda, obviously it's not designed to bring us together," said Senate Minority Leader Mitch McConnell of Kentucky, who calls the start of Obama's second term "a new era of liberalism." And it's not just congressional Republicans who could stand in Obama's way as he seeks to make good on his pledges. Senate Democrats from conservative-leaning states — who, unlike Obama, still face future elections — may have reservations about backing a liberal agenda in the lead-up to the 2014 midterms. Democratic resistance is already proving to be a problem for some of the toughest gun control measures that Obama proposed ahead of his inauguration in response to the elementary school shooting in Newtown, Conn. An assault weapons ban, in particular, appears to be in jeopardy, with Senate Majority Leader Harry Reid of Nevada among the Democrats yet to voice support. Obama's tilt to the left follows a presidential campaign that left open questions about what policies he would pursue if he won a second term. His most specific campaign pledge was to let George W. Bush-era tax cuts expire for the wealthiest Americans, a step he was able to achieve during the "fiscal cliff" negotiations in late December. That's why many of his strongest supporters were surprised — some pleasantly — by the issues he raised in his inaugural address, particularly his call for tackling the threat of climate change, a topic that garnered little attention during the campaign. And after campaigning on a balanced approach to deficit reduction, including making tough choices on entitlement programs, Obama used his inauguration to extol the virtues of Medicare, Medicaid and Social Security. He made just one reference to the huge federal deficit. Obama has previously said he's willing to put government entitlements on the table as Washington seeks to reduce the deficit, and aides say his inaugural address doesn't change that. Obama also became the first president to use the word "gay" in an inaugural address, asserting that the nation's journey is not complete until "our gay brothers and sisters are treated like anyone else under the law." Progressive groups welcomed the president's rhetoric, but made it clear that words alone would not be enough. Adam Green, co-founder of the political action group Progressive Change Campaign Committee, said that if the president's inaugural address does become a template for his second-term governing strategy, "that will allow the president to win big victories and secure a legacy of bold progressive change that helped millions of Americans." "We hope he goes that route, and we will proudly rally to his side if he does," Green said. Still, people close to the president say he feels emboldened since winning re-election and wants to act quickly on progressive issues that eluded him during his first term. His supporters have also created a campaign spin-off organization to support his second-term agenda. The outside group, Organizing for Action, will employ many of the same people who led Obama's two presidential bids and will have access to his campaign's voter and donor data. The new group is expected to focus on backing his positions in legislative battles, including gun control and immigration. Some of what the president may pursue, particularly when it comes to climate change, may be through executive branch actions that don't need congressional approval. The Pentagon this week acted on its own to lift a ban that kept female service members out of combat positions. And the Education Department unilaterally ordered schools to include students with disabilities in sports programs or provide equal alternative options. White House officials are scouring rule books for other actions the West Wing and government agencies can take on their own. Associated Press writers Josh Lederman contributed to this report. Apple has stopped doing business with a Chinese manufacturer after a report said it had employed 74 underage workers. According to Apple's Supplier Responsibility Report, which was released by the company Thursday, Guangdong Real Faith Pingzhou Electronics was employing workers under the age of 16. "Our auditors were dismayed to discover 74 cases of workers under age 16 — a core violation of our Code of Conduct. As a result, we terminated our business relationship with PZ," the company says in the report. Apple has now lost its spot as the most valuable publicly traded company, one year after it first firmly overtook ExxonMobil. Even though it announced a record number of iPhone and iPad sales in its last quarter earnings, its stock price has fallen over 12 percent. Apple says it is working hard to improve labor conditions at the factories of its Chinese contractors. It said it also discovered that one of the region's labor agencies had conspired with the manufacturer, providing children to them and helping forge age-verification documents. Apple said in its report that it alerted the provincial government, which fined the agency and suspended its business license. "The children were returned to their families, and PZ was required to pay expenses to facilitate their successful return," Apple says in the report. In an interview with Bloomberg, Apple's Senior Vice President of Operations, Jeff Williams, said child labor was being used more than companies care to admit. "Most companies, they either don't report on it at all, or they say they look for it and found none, or they obscure the data in some way," Williams told Bloomberg. "If they're not finding it, they're not looking hard enough." ABC News' Bill Weir visited the factory of Apple's Foxconn supplier last year and did not see any underage workers. "But while we looked hard for the kind of underage and maimed workers we've read so much about, we mostly found people who face their days through soul-crushing boredom and deep fatigue," Weir wrote about his visit. In the 37-page Supplier Responsibility Progress Report, which can be viewed here, Apple said there had been a 72 percent increase in facility audits. According to the report, Apple achieved an average of 92 percent compliance with the goal, for now, of a maximum 60-hour work week. Apple vowed last year to improve working conditions at its manufacturing facilities in China, vowing to work specifically on reducing working hours for Chinese workers. In March 2012, the Fair Labor Association released a report on the poor conditions at Apple's Foxconn supplier. The organization gave a long list of recommendations to Apple and Foxconn, and both Apple and Foxconn agreed to follow them. In August, the FLA said that that Foxconn had completed 280 action items on time or ahead of schedule. By July 1, 2013, Foxconn has promised to reduce workers' hours to 49 hours per week and stabilize pay -- though the limit is rarely enforced because workers often want to work overtime and make ends meet. Apple announced in December that it would begin to make some of its Mac computers in America in 2013. A puzzle at the heart of the atom refuses to go away. The most precise measurement yet of the proton's radius confirms that it sometimes seems smaller than the laws of physics demand – an issue that has been hotly debated for two years. The latest finding deepens the need for exotic physics, or some other explanation, to account for the inconsistency. "If we were in a hole before, the hole is deeper now," says Gerald Miller of the University of Washington in Seattle, who was not involved in the new measurement. The saga of the proton radius began in 2010, when a group led by Randolf Pohl at the Max Planck Institute of Quantum Optics in Garching, Germany, determined the width of the fuzzy ball of positive charge – and found it was smaller than had been assumed. Previous teams had inferred the proton's radius, which is impossible to measure directly, by studying how electrons and protons interact. One method uses the simplest atom, hydrogen, which consists of one electron and one proton. A quirk of quantum mechanics says that an electron in an atom can only orbit its proton at certain distances, corresponding to different energy levels. The electron can jump between levels if it absorbs or releases energy in the form of a photon of light. By measuring the energy of photons emitted by an excited hydrogen atom, physicists can figure out how far apart the energy levels are, and thus the distances of the permitted electron orbits. A theory called quantum electrodynamics then allows them to calculate how far the proton's ball of charge must extend to keep the electrons at those distances. This method gave a charge radius for the proton that was about 0.877 femtometres, less than a trillionth of a millimetre. Pohl and colleagues used a novel method. They created an exotic version of hydrogen that replaces the electron with a muon, a particle that has the same charge as the electron but is 200 times heavier. Its extra bulk makes it more sensitive to the proton's size, meaning radius measurements based on muons are orders of magnitude more precise. The new method didn't just make the measurements more precise. It also changed them: the muonic hydrogen gave a radius of 0.8418 femtometres, 4 per cent less than before. That might not sound like much, but in the world of particle physics, where theory and experiment can agree to parts in a billion, it was scandalous. A lively discussion sprang up, with some physicists claiming problems with Pohl's experiments and interpretations, and others suggesting gaps in the standard model of particle physics. Pohl and colleagues have now repeated their experiment. The measurement of the radius is now even more precise than in 2010 – and it is still 4 per cent smaller than the value from hydrogen-based experiments. Pohl reckons that there are three likely explanations. His experiment could have errors, although the confirmation makes that less likely. Alternatively, the electron experiments could be off. "This would be the most boring possibility," says Pohl. The third, and most exciting, possibility is that muons do not interact with protons in the same way as electrons. In other words, the proton's apparent radius changes a little bit depending on which particle it is interacting with. If true, that might require the existence of unknown particles that alter the way the muon interacts with the proton. Those particles could, in turn, solve some of the problems with the standard model of particle physics. They could, for instance, provide a candidate for dark matter, the mysterious stuff that makes up more than 80 per cent of the mass in the universe. Miller, Pohl and Ron Gilman of Rutgers University in Piscataway, New Jersey helped organise a workshop with 50 proton experts in Trento, Italy, last October to hash out the details of the problem – and arrived at a verdict of sorts. "Because the muon experiments seem to be so solid, the most popular answers were that there's some beyond-the-standard-model physics differentiating between muon and electron, which would be very important," Gilman says. "That would be monumental, truly," Miller says. But Miller also has a less radical suggestion, which could reconcile all the measurements without invoking new particles. According to quantum electrodynamics, two charged particles can interact with each other by exchanging a photon – it's as if they spontaneously create a basketball and throw it between them, he says. The equations also allow for a more complicated interaction where the particles create two balls, and juggle them. Until now this type of interaction was considered too rare to be important, but Miller reckons that the muon's greater mass could make it a better juggler. That would strengthen the proton's interaction with it and make the proton look smaller to the muon without requiring any new physics. All these ideas will be up for review in a few years' time when new experiments, including shooting muons at protons to see how they scatter and building muonic helium atoms to measure their energy levels, are completed. "It's quite likely that through other experiments, in two to three years we might get an end to this," Miller says. "It shouldn't take forever." DAVOS: Israeli officials said Thursday that military action against Iran needed to stay on the table, as former US secretary of state Henry Kissinger warned of a crisis over Tehran's nuclear ambitions in the "very foreseeable future". Speaking at the World Economic Forum in Davos, Israeli President Shimon Peres and Defence Minister Ehud Barak said the threat of military action was vital to efforts against Iran's nuclear programme. "There will be more attempts to try and negotiate, but there will always be in the horizon a military option, because if the Iranians think it's only economic and political, they won't pay attention," Peres told global political and business leaders at the annual gathering in the Swiss ski resort. Israel and Western powers accuse Iran of seeking to acquire a weapons capability under the guise of its nuclear energy programme but Iran denies the charge, saying its work is for peaceful purposes only. Prime Minister Benjamin Netanyahu, who emerged from an election Tuesday with a new term as Israel's leader, has frequently warned about the danger of Iran's nuclear programme. Israel has refused to rule out a military strike to prevent Iran from obtaining nuclear arms. Barak, who has announced plans to retire after Netanyahu forms a new government, told the forum that stronger sanctions were needed against Iran. "There is a need for much more drastic sanctions, a kind of quarantine of all imports and exports," Barak said, though he admitted that China and Russia were unlikely to agree. He said he understood Washington's desire to have "all alternatives" exhausted before military action over Iran, but that there was also a need to be ready to carry out targeted attacks. "If worst comes to worst, there should be a readiness and capability to launch a surgical operation that will delay them by a significant timeframe and probably convince them... the world is determined to block them," Barak said. In a wide-ranging talk on foreign affairs, Kissinger said he expected the Iranian nuclear issue to soon come to a head. "For 15 years, the permanent members of the United Nations Security Council have declared that a nuclear Iran is unacceptable, but it has been approaching," he said. "People who have advanced their view will have to come to a determination about how to react or about the consequences of non-reaction," he said. "I believe this point will be reached within a very foreseeable future." Kissinger said negotiations with Iran needed to be given "a real chance" and that "unilateral action by Israel would be a desperate last resort." He said he expected "Iran to be high on the agenda" of US President Barack Obama's new administration, and said failure to deal with the question could lead to a spread of nuclear weapons in the region. "That would be a turning point in human history," Kissinger warned. Israel has been pressing Obama to set a red line for Iran on the nuclear issue, after Netanyahu warned at the UN General Assembly in September that Tehran could have the necessary material for a first bomb by the summer of 2013. The new US secretary of state nominee, Senator John Kerry, told a confirmation hearing on Thursday that "the clock is ticking", and that Washington will not be satisfied with just containing Iran. WASHINGTON (AP) — The Justice Department is conducting a criminal investigation into possible contract rigging by the general counsel at the government agency that distributes foreign aid, documents obtained by The Associated Press show. Memos from the inspector general of the U.S. Agency for International Development also reveal that the IG is investigating whether Deputy Administrator Donald Steinberg tried to interfere with an internal investigation. Internal inspector general documents said he told the IG's office it shouldn't have investigated the alleged rigging, nor should the matter have been referred to the Justice Department. Inspectors general are watchdogs within a federal agency and are supposed to operate independently. The original investigation focused on whether Lisa Gomer, USAID general counsel, may have "wired" a contract last May so the winner of the solicitation would be the agency's retiring chief financial officer, David Ostermeyer. The contract bidding for a "senior government-to-government assistance adviser" was canceled after questions were raised. "If the solicitation was in fact designed for Ostermeyer to win, Ms. Gomer and USAID may have violated various federal laws, the Federal Acquisition Regulation and government ethics policies," according to a letter from two House members to USAID Administrator Rajiv Shah in November. The letter was written by Rep. Darrell Issa, R-Calif., chairman of the House Oversight and Government Reform Committee, and Rep. Jason Chaffetz, R-Utah, chairman of the panel's national security subcommittee. On Wednesday, the inspector general's office wrote Issa's committee saying the Justice Department authorized the inspector general to give the committee documents related to Steinberg's potential interference. The Justice Department said it would continue to investigate the original allegations. All the documents were described as "law enforcement sensitive." One document said Steinberg told inspector general officials that Shah asked him to speak with the internal investigators about the review. Steinberg, according to another inspector general document, ripped into the independent watchdog. "When people are slapping badges down, reading rights and monitoring who is calling who as it relates to career people, it is a mistake," Steinberg was quoted as telling his agency's investigators. Steinberg added, according to the document, "We are not that kind of agency. People are being told they need to hire lawyers and that is inappropriate." The memo also quoted Steinberg as saying "now that Justice is involved, it is like the IG is out to get these people. Justice is going to proceed criminally. This should have come through the front office first." The law governing inspectors general says that the internal investigators "shall report expeditiously to the attorney general whenever the inspector general has reasonable grounds to believe there has been a violation of Federal criminal law." There was no response to a message requesting comment, left on the home answering machine of a David Ostermeyer. Steinberg declined to comment, and Gomer could not immediately be reached for comment. A senior USAID official, who spoke on condition of anonymity because he was not authorized to comment on the subject, said Gomer has been reassigned from her general counsel's position and has submitted her resignation effective Feb. 9. The official said she was not ordered to resign. The USAID spokesman, Kamyl Bazbaz said, "We take very seriously the independence of the inspector general and the importance of the agency's cooperation with IG audits and investigations." He added, "It is the usual practice for the IG to brief the senior leadership of the agency regarding its ongoing investigations and audits." In an inspector general's "memorandum of interview" last June, investigators described their probe into allegations that "Lisa Gomer, general counsel for USAID colluded with David Ostermeyer, chief financial officer for USAID, by working with him to write a scope of work for a personal service contract ... in the Office of General Counsel." "Gomer planned to select Ostermeyer for the position," the memo said. The job Ostermeyer would have received in working with foreign governments would have paid between $123,758 and $155,500, according the USAID solicitation document. The solicitation said "the work is generally sedentary and does not pose undue physical demands," an important factor in an agency where USAID workers can live in poor conditions in dangerous countries. According to an inspector general's document from last June, Steinberg said he "had already looked into this matter thoroughly and knows there is nothing to it." Steinberg said the contract award was canceled because of issues raised about the procurement. "He said it is a mistake to have a criminal investigation under way," the investigative document said. "To take a matter to the Department of Justice for criminal consideration without first reporting the issues to the front office is inappropriate and a judgment error on the IG's part." According to the document the deputy assistant inspector general for investigations, Lisa McClennon, told Steinberg "the agency never has the right to instruct the inspector general's office on whether or not something is presented to Justice." Issa said in a statement, "This interference by the top USAID official and his deputy in a corruption investigation of other top officials is disturbing and outrageous. Inspectors general can only be effective if they are independent. Efforts to intimidate or chastise an inspector general for investigating agency corruption and submitting findings to the Justice Department are simply incompatible with honest government." Defense Secretary Leon Panetta today lifted the ban on women serving in combat positions, opening the door to more than 200,000 new military posts and raising a number of important questions, including: Will women eventually be eligible for the draft? By law, all male U.S. citizens and permanent residents must register with the Selective Service System within 30 days of their 18th birthday. Registration puts those “male persons” on the list the government uses if ever the draft returns and conscription in the military is deemed necessary in a time of war. As of a 1994 review, women were still exempt from registering because they did not serve in combat positions. Today’s change in Pentagon policy, however, could ultimately result in a change to the law. But it will take more than just the stroke of the defense secretary’s pen for the Selective Service Act to include mention of women. “With regard to what will happen from there, I can’t say,” said the official. Defense Secretary Leon Panetta later admitted to reporters that he, too, did not know the potential impact of the change to the Selective Service Act. “That’s not our operation,” said Panetta. The Selective Service System is a federal agency independent of the Department of Defense. On Friday the 6th of August … the Captain (who was the owner of the vessel) came into the cabin & said "I am afraid the ship's on fire. Come & see what you think of it." In early life both Darwin and myself became ardent beetle-hunters. Both Darwin and myself had, what he terms "the mere passion of collecting"… Now it is this superficial and almost child-like interest in the outward forms of living things, which, though often despised as unscientific, happened to be the only one which would lead us towards a solution of the problem of species. The idea came to me, as it had come to Darwin, in a sudden flash of insight: it was thought out in a few hours – was written down with such a sketch of its various applications and developments… then copied on thin letter-paper and sent off to Darwin – all within one week. I should have had no cause for complaint if the respective shares of Darwin and myself in regard to the elucidation of nature's method of organic development had been thenceforth estimated as being, roughly, proportional to the time we had each bestowed upon it when it was thus first given to the world – that is to say, as 20 years is to one week. How did you feel looking back on your life's work, at the age of 89? I sincerely wish you all some of the delight in the mere contemplation of nature's mysteries and beauties which I have enjoyed. LOS ANGELES: A US judge ordered director James Cameron to hand over drafts of the screenplay for "Avatar" Wednesday, to lawyers for a man claiming he wrote the script on which the 3D blockbuster was based. Eric Ryder is seeking compensation from Cameron and his production company Lightstorm Entertainment, claiming that the 2009 Oscar-nominated film is based on a story he wrote called "K.R.Z. 2068." He filed a lawsuit in December 2011, saying he spent two years developing the story. On Wednesday Los Angeles Superior Court Judge Alan Rosenfield ordered Cameron's lawyers to turn over screenplay drafts. "We have to be careful and sensitive about ideas and information," said the judge. But he denied a request by Ryder's lawyers to grant access to the personal calendars of Cameron and Jon Landau, the chief operating officer of Cameron's Lightstorm Entertainment Inc.
Ryder's lawyer K. Andrew Kent said his legal team will also get access to backup tapes from computers used by Cameron. "Avatar," about a paraplegic US marine with split loyalties after being sent to a distant world wanted for its mining potential, was seen as a breakthrough in the use of 3D technology, and has grossed more than US$2.7 billion worldwide. WASHINGTON (AP) — Secretary of State Hillary Rodham Clinton delivered fiery rejoinders Wednesday to Republican critics of the Obama administration's handling of the deadly attack on a U.S. mission in Benghazi, facing off with lawmakers who included potential 2016 presidential rivals. At times emotional and frequently combative, Clinton rejected GOP suggestions in two congressional hearings that the administration tried to mislead the country about the Sept. 11 attack that killed Chris Stevens, the U.S. ambassador to Libya, and three other Americans. She insisted the State Department is moving swiftly and aggressively to strengthen security at diplomatic posts worldwide. In her last formal testimony before Congress as America's top diplomat — but perhaps not her last time on the political stage — Clinton once again took responsibility for the department's missteps and failures leading up to the assault. But she also said that requests for more security at the diplomatic mission in Benghazi didn't reach her desk, and reminded lawmakers that they have a responsibility to fund security-related budget requests. Three weeks after her release from a New York hospital — admitted for complications after a concussion — Clinton was at times defiant, complimentary and willing to chastise lawmakers during more than 5 ½ hours of testimony before two separate committees. She tangled with some who could be rivals in 2016 if she decides to seek the presidency again. Her voice cracking at one point, Clinton said the attack and the aftermath were highly personal tragedies for the families of the victims who died — Stevens, Sean Smith, Tyrone Woods and Glen Doherty — as well as herself. "I stood next to President Obama as the Marines carried those flag-draped caskets off the plane at Andrews. I put my arms around the mothers and fathers, sisters and brothers, sons and daughters and the wives left alone to raise their children," she told the Senate Foreign Relations Committee at a packed hearing. Clearly annoyed with Republican complaints about the initial explanation for the attack, she rose to the defense of U.N. Ambassador Susan Rice, who was vilified for widely debunked claims five days after the attack that protests precipitated the raid rather than terrorism. Clinton said, "People were trying in real time to get to the best information." And she said her own focus was on looking ahead on how to improve security rather than revisiting the talking points and Rice's comments. Sen. Ron Johnson, R-Wis., pressed her on why "we were misled that there were supposedly protests and something sprang out of that, an assault sprang out of that." "With all due respect, the fact is we had four dead Americans," she said, her voice rising and quivering with anger as she and Johnson spoke over each other. "Was it because of a protest? Or was it because of guys out for a walk one night decided they would go kill some Americans? What difference, at this point, does it make? It is our job to figure out what happened and do everything we can to prevent it from ever happening again, Senator." If Johnson's comments drew an irritated response from Clinton, she notably ignored Sen. Rand Paul, R-Ky., when he said he would have fired her if he had been in charge and found that she had not read cables from her team in Libya asking for more security. Paul is a potential 2016 presidential candidate. "Had I been president and found you did not read the cables from Benghazi and from Ambassador Stevens, I would have relieved you of your post," Paul said. "I think it's inexcusable." Clinton and other officials have testified that requests for additional security did not reach her level, and a scathing independent review of the matter sharply criticized four senior State Department officials who have been relieved of their duties. Later, before the House Foreign Affairs Committee, Republican Rep. Jeff Duncan of South Carolina repeatedly challenged Clinton's claim to have looked at the tragedy with "clear eyes," saying she should have personally ensured security at the mission. He said Clinton had "let the consulate become a death trap" in denying requests for additional security and called it "malpractice." Clinton said she could have let the review board's report remain classified and told Congress "goodbye" before leaving office. But she said, it's "not who I am. It's not what I do." Absent from the Senate hearing was Sen. John Kerry, D-Mass., the man tapped to succeed Clinton, who is leaving the administration after four years. Kerry, defeated by George W. Bush in the 2004 presidential election, is expected to win swift Senate approval. Clinton is to introduce him at his confirmation hearing on Thursday. Politics play an outsized role in any appearance by Clinton, who was defeated by Barack Obama in a hard-fought battle for the 2008 Democratic presidential nomination. She is the subject of constant speculation about a possible bid in 2016. A former New York senator and the wife of former President Bill Clinton, she is a polarizing figure but is ending her tenure at the State Department with high favorability ratings. A poll last month by the Pew Research Center for the People & the Press found 65 percent of Americans held a favorable impression of her, compared with 29 percent unfavorable. On the panel at the Senate hearing were two possible 2016 Republican presidential candidates — Florida's Marco Rubio and Paul, a new member of the committee — as well as John McCain of Arizona, who was defeated by Obama in November 2008. Clinton, 65, did little to quiet the presidential chatter earlier this month when she returned to work after her hospitalization. On the subject of retirement, she said, "I don't know if that is a word I would use, but certainly stepping off the very fast track for a little while." In a second round of questioning on Wednesday, Clinton testified before the House Foreign Affairs Committee where Republican members pressed her on why cables and other memos about security deficiencies in Benghazi seemed to be ignored. "The dots here were connected ahead of time. The State Department saw this was coming," said Rep. Ed Royce, R-Calif., the chairman of the panel. "The State Department didn't act." Clinton told senators the department is implementing the 29 recommendations of the review board and going beyond the proposals, with a special focus on high-threat posts. Clinton had been due to testify in December but postponed her appearances after fainting, falling and suffering a concussion while recovering from a stomach virus that left her severely dehydrated. She was then diagnosed with a blood clot near her brain and returned to work only on Jan. 7. She won bipartisan well-wishes on her recovery, but while Democrats were quick to praise her for accomplishments as secretary of state, Republicans then hit her with withering criticism. "It's wonderful to see you in good health and combative as ever," said McCain. But in the same breath, he dismissed her explanation of events, the administration's response to warnings about the deteriorating security situation in Libya and even the attention paid to Libya after rebels toppled Moammar Gadhafi. "The answers, frankly, that you've given this morning are not satisfactory to me," McCain said. To McCain, a friend that Clinton served with in the Senate, she replied matter-of-factly: "We just have a disagreement. We have a disagreement about what did happen and when it happened with respect to explaining the sequence of events." Some Democrats raised the point that Congress had cut funding for embassy security. "We have to get our act together," she told the panels, chiding House GOP members for recently stripping $1 billion in security aid from the hurricane relief bill and the Senate panel for failing for years to produce a spending authorization bill. Rep. Ileana Ros-Lehtinen, R-Fla., expressed incredulity that the independent review board did not interview Clinton for its extensive report. She also complained about the department's "false narrative" that four employees lost their jobs over the attack. "There's just been a shuffling of the deck chairs," said Ros-Lehtinen. Clinton said earlier that she was not asked to speak to the review board but would have been available. She said the four employees have been removed from their jobs and have been placed on administrative leave, but federal rules prevent the department from taking more drastic steps. Her testimony followed more than three months of Republican charges that the Obama administration ignored signs of a deteriorating security situation and cast an act of terrorism as mere protests over an anti-Muslim video in the heat of a presidential election. U.S. officials suspect that militants linked to al-Qaida carried out the attack. One of the biggest surprises of President Barack Obama's inaugural address on Monday was how much he focused on fighting climate change, spending more time on that issue than any other. The President pointed out that recent severe weather supplied an urgent impetus for energy innovation and staked the nation's economic future on responding to a changing climate. "We cannot cede to other nations the technology that will power new jobs and new industries—we must claim its promise," Obama said. "That's how we will maintain our economic vitality and our national treasure—our forests and waterways; our croplands and snowcapped peaks. That is how we will preserve our planet, commanded to our care by God." 2. Invest federal stimulus money in nuclear power. It's hardly a perfect fuel, as accidents like Japan's Fukushima fallout have shown, but with safety precautions new nuclear plants can meaningfully offset dirtier types of energy, supporters say. "Nuclear is the only short- to medium-term way to really get away from fossil fuels," said Peter Raven, president emeritus of the Missouri Botanical Garden. He said the damage done by relentless global warming will far exceed the damage done by faults in the nuclear system. 5. Experiment with capturing carbon. Huge untapped reserves of natural gas and oil make it unlikely that the U.S. will transition away from fossil fuels in the immediate future. Instead, said Wallace Broecker, geology professor at Columbia University's Lamont-Doherty Earth Observatory, we should attack the atmosphere's carbon surplus directly. "[Obama] could make available funds to build and test prototype air capture units" to capture and store CO2, said Broecker. Removing some carbon from the atmosphere could buy valuable time as policy makers and scientists explore more permanent solutions. 6. Grow government research for new energy sources. The Department of Energy has a nimble program that's tasked with innovative energy research—the Advanced Research Projects Agency-Energy. The ARPA-E funds research in biofuels, transmission, and battery storage, with an annual budget of $275 million. Last year, DOE officials requested at least $75 million more. Increasing funding for ARPA-E, said Rafe Pomerance, former deputy assistant secretary of state for environment and development and currently an environmental consultant, "you get new technologies that undercut coal, oil, and gas." Plus, he said, you get a competitive advantage if American researchers uncover the next big idea in new energy. 7. Tax carbon. Congress would have to agree, but many climate experts say that the most meaningful way to tackle emissions is to set a price on carbon. "We should be asking people to pay the cost of putting carbon into the atmosphere as they buy the fuel," said Josh Willis, climate scientist and oceanographer at NASA's Jet Propulsion Laboratory. To gain political support for the idea, Obama would probably have to show that the tax would help accelerate technology, grow new industries, and pay down the deficit. 8. Dial back the federal government's energy use. With more than 1.8 million employees, $500 billion in annual purchasing power, and 500,000 buildings to operate, the federal government has been a leader in reducing energy use since Obama signed a 2009 executive order to cut waste. "I would urge him to keep using the power of government to promote energy conservation," said Syndonia Bret-Harte, an Arctic biologist who studies climate change at the University of Alaska, Fairbanks. 9. Build a scientific clearinghouse for climate information. "I advocate for building a better information system on what is happening and why," said Kevin Trenberth, head of the Climate Analysis Section at the U.S. National Center for Atmospheric Research. That involves compiling observations related to climate change from around the world and using the data to refine climate modeling. Think of it as a one-stop, user-friendly website that clearly demonstrates how weather data from around the globe are influenced by broader shifts in the planet's climate. 10. Keep talking. Despite a consensus among top scientists, the world still needs some convincing on climate change. A CNN poll last week found that just 49 percent of Americans agree that global warming is real and is due to human activities. "The most important thing the President can do is to build on his inaugural comments to heighten the sense of urgency about rapid climate destabilization and clarify its connection to virtually every other issue on the national agenda," said David Orr, environmental studies professor at Oberlin College. That means using the bully pulpit to show how a more volatile climate affects everything from agriculture to transportation to 21st-century warfare. Christine Dell'Amore, Rob Kunzig, and Jane J. Lee contributed reporting. Defense Secretary Leon Panetta will lift a longstanding ban on women serving in combat, according to senior defense officials. The services have until this May to come up with a plan to implement the change, according to a Defense Department official. That means the changes could come into effect as early as May. The services will have until January 2016 to complete the implementation of the changes. The military services will also have until Janurary 2016 to seek waivers for certain jobs -- but those waivers will require a personal approval from the secretary of defense and will have to be based on rationales other than the direct combat exclusion rule. The move to allow women in combat, first reported by the Associated Press, was not expected this week, although there has been a concerted effort by the Obama administration to further open up the armed forces to women. The Joint Chiefs of Staff unanimously recommended in January to Secretary Panetta that the direct combat exclusion rule should be lifted. "I can confirm media reports that the secretary and the chairman are expected to announce the lifting of the direct combat exclusion rule for women in the military," said a senior Defense Department official. "This policy change will initiate a process whereby the services will develop plans to implement this decision, which was made by the secretary of defense upon the recommendation of the Joint Chiefs of Staff." Chairman of the Joint Chiefs Gen. Martin Dempsey sent Panetta a memo earlier this month entitled, "Women in Service Implementation Plan." "The time has come to rescind the direct combat exclusion rule for women and to eliminate all unnecessary gender-based barriers to service," the memo read. "To implement these initiatives successfully and without sacrificing our warfighting capability or the trust of the American people, we will need time to get it right," he said in the memo, referring to the 2016 horizon. Women have been officially prohibited from serving in combat since a 1994 rule that barred them from serving in ground combat units. That does not mean they have been immune from danger or from combat. As Martha Raddatz reported in 2009, women have served in support positions on and off the frontlines in Iraq and Afghanistan, where war is waged on street corners and in markets, putting them at equal risk. Hundreds of thousands of women deployed with the military to those two war zones over the past decade. Hundreds have died. Woman have been able to fly combat sorties since 1993. In 2010, the Navy allowed them on submarines. But lifting restrictions on service in frontline ground combat units will break a key barrier in the military. Panetta's decision will set a January 2016 deadline for the military service branches to argue that there are military roles that should remain closed to women. 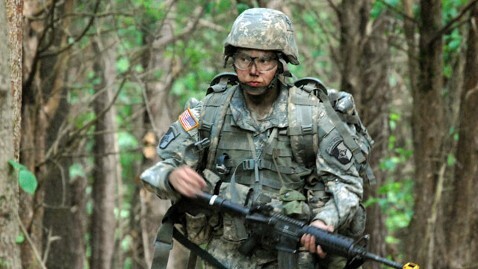 In February 2012 the Defense Department opened up 14,500 positions to women that had previously been limited to men and lifted a rule that prohibited women from living with combat units. Panetta also directed the services to examine ways to open more combat roles to women. However, the ban on direct combat positions has remained in place. Advocates for equality in the services will be pleased. On Capitol Hill today, retired Chief Master Sgt. Cindy McNally, a victim of sexual assault in the military, said placing women in combat roles would help equalize the services and actually cut down on sexual assaults, which have emerged as a major problem in the military.